This motor is ideal for indoor models of 50g-70g auw. With only 5.2gms weight and 20w of power it spins a 4x2.5 to 5x3 prop giving 80gm of thrust. bullet connectors or 3 pin 2mm space plug/socket. Motor is supplied with a motor mount and prop saver adapter; other prop adapters can be found here. 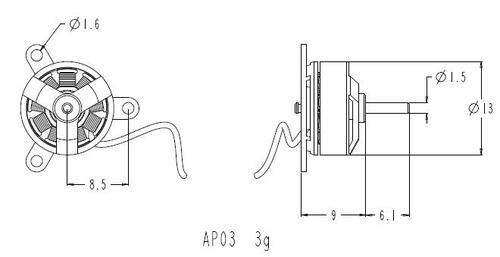 Suitable connectors for motor/ESC are available here - e.g. 0.8mm or 2mm bullet connectors or 3 pin 2mm space plug/socket. Some batches of these motors have 2mm male bullet connectors fitted to the motor leads, but no matching female connectors in the package. The motor mount grub screw requires a 1.27mm hex key and the grub screw in the end-bell securing the shaft requires a 0.9mm hex key. A 2g motor designed for single LiPo cell operation. A GWS 3x2 prop gives 27g thrust at 1.8A. Suitable connectors for motor/ESC are available here - e.g. 0.8mm or 2mm bullet connectors or 3 pin 2mm space plug/socket. The GWS 3" props are a tight push fit onto the AP03 1.5mm shaft, a reamer is available. The GWS 4" props require a prop adapter: either the push-on collet adapter or the prop saver. Suitable connectors for motor/ESC are available here - e.g. 0.8mm or 2mm bullet connectors or 3 pin 2mm space plug/socket. A 5g motor designed for 1S and 2S operation with winds of 5000Kv and 3000Kv. With a GWS 5x3 prop, the 3000Kv motor gives 45g thrust on 1S or 110g on 2S. The AP05 is supplied with a prop saver adapter. The push-on collet adapter may also be used for a rigid prop mounting (suitable for GWS 4" and 5" props). A three part firewall mount for APxx micro motors (AP02, AP03 and AP05). Lightness and strength is provided by the ply-balsa-ply sandwich construction. The mount kit includes 3 self tapping screws. A good motor for the slightly larger/heavier park flyer. Run on 2S or 3S, max power 80W. 22mm diameter, 3mm shaft, weight 19g. Recommended prop: (2S) 6x3, (3S) 5x3. A small brushless outrunnier ideal for parkfly models conversions weighing up to 230g/8oz on 2S and up to 400g/14oz on 3S. 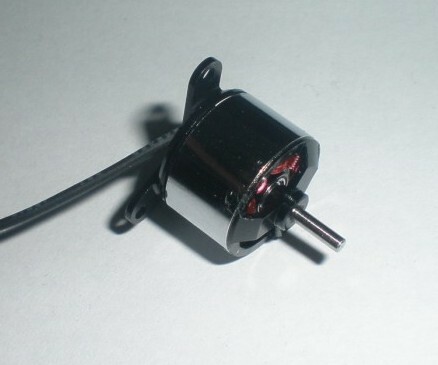 A tiny 10mm diameter brushless inrunner motor suitable for use in the GWS EDF30 fan or for micro cars.